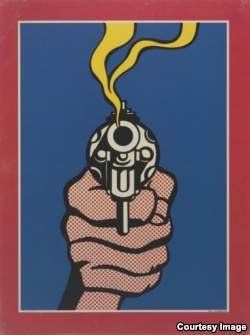 The year 1968 was a time of great social and political unrest in the United States. The Vietnam War had reached a turning point. The Civil Rights Act was signed into law, which helped guarantee fair housing to all Americans. On television, people were watching everything from the summer and winter Olympics to the first manned orbit of the moon. Newsmakers from 1968 included President Lyndon Johnson, civil rights leader Martin Luther King, Junior, and then-presidential candidate Richard Nixon. It was also the year when the Smithsonian Institution opened the National Portrait Gallery to the public. The museum is a short walk from the National Mall in Washington, D.C.
To celebrate its 50th anniversary, the museum is presenting a show about that memorable year and the people who helped shape it. 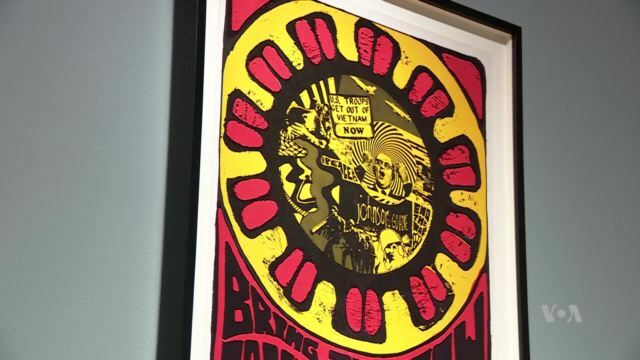 It is called “One Year: 1968, An American Odyssey.” The show offers 30 images -- from photographs, paintings and magazine covers that represent that period. Museum director Kim Sajet says the show is especially timely, as the nation is once again dealing with major political and social changes. A large part of the dissatisfaction 50 years ago was U.S. involvement in Vietnam. Americans increasingly opposed the war. President Johnson supported the war effort, and the government in South Vietnam. 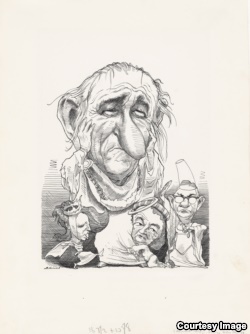 His unpopularity is represented in a political cartoon that is part of the exhibit. Artist David Levine created the cartoon. The image shows Johnson as King Lear, the lead character of the Shakespeare play of the same name. As theater-goers know, the king slowly loses his ability to think clearly. Other major social and political issues were entering American culture in 1968, too. Sajet says she sees many similarities between 40 years ago and today. There is also a photograph of Shirley Anita Chisholm of New York. She was the first African-American woman elected to the House of Representatives. And she was the first African-American woman to compete for the Democratic Party's presidential nomination. “We continue to have conversations about our electoral process and how women in politics are faring,” Sajet noted. 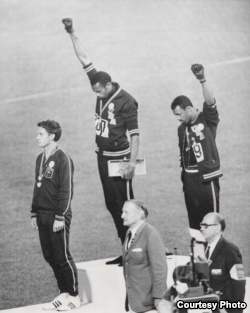 Another powerful image is of Tommie Smith and John Carlos, two members of the U.S. Olympic team. The picture shows them each raising an arm during a medal ceremony at the Mexico City games. The two were protesting the mistreatment of African Americans and racial inequality in the United States. The National Portrait Gallery went through a careful process to find images that best represented 1968, said James Barber. 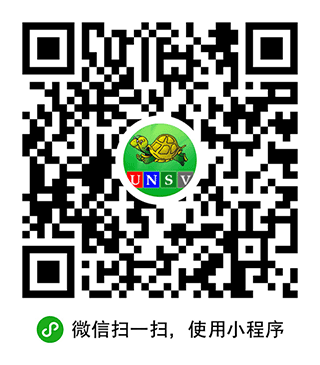 He is the museum’s historian. “We were also looking at major newsmakers from that year,” he said. Many images are presented side-by-side to make a point, Barber said. The photo of Shirley Chisholm hangs near one of former Alabama Governor George Wallace. He may be best remembered for policies meant to separate whites from blacks. And the image of a gun is placed next to a photo of Senator Robert F. Kennedy, who was shot to death in June of 1968. Two months earlier, a gunman had shot and killed Martin Luther King, Jr. The show also has pictures of people who rose to fame that year. They include Peggy Fleming. She was the only American to win a gold medal at the Winter Olympics that year in France. Another photo shows tennis player Arthur Ashe, who in 1968 captured the U.S. Open men’s championship. In doing so, he became the first African American to win a major tennis event. Rock music greats also made news in 1968. Jimi Hendrix and Janis Joplin are seen in a black-and-white image taken by photographer Irving Penn. 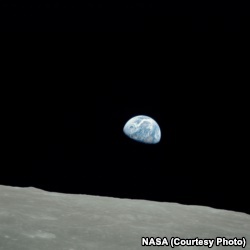 Earthrise, a photo taken by astronaut William Anders during the Apollo 8 moon mission, shows our planet in the vastness of space. One of the most striking images of 1968 was taken on December 24 by astronaut William Anders, one of three Apollo 8 crew members. The three were part of the first manned flight to orbit the moon. Anders' photo provided a never-before-seen look at planet Earth. The historic space flight brought a hopeful note to the end of 1968, a year remembered as one of the most eventful in American history. I'm Dorothy Gundy. And I'm Bryan Lynn. Julie Taboh reported this story for VOANews.com. George Grow adapted her report for Learning English. Ashley Thompson was the editor.